In the past, we’ve included both mirrorless and DSLR cameras in our enthusiast interchangeable lens camera roundup. Enthusiast cameras, by the way, are cameras that sit right above the consumer-level category and just under high-end camera-category (high-end refers to cameras with full-frame sensors that are not quite pro-level, think Nikon D610, Canon 6D, Sony a99, and the Sony a7-series). This year, we opted to split the category in two, as we had a hard time definitively deciding on just one or two overall top picks. Its not that we are indecisive, just that we are incredibly impressed with the number of very good choice that fall into this category. 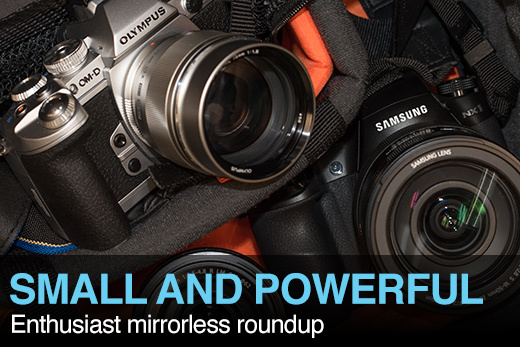 What follows is our enthusiast mirrorless roundup. 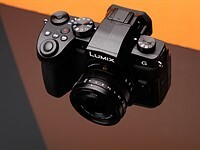 In it, you will find some of the top offerings from the industry’s mirrorless camera manufactures, excluding Sony, as we consider the a7-series to fall into the high-end mirrorless category. We’ll be covering high-end interchangeable lens cameras in a separate roundup very soon. 7 Which camera should I buy? I would have put the XT1 as number 1 and EM1 as second or close to first. 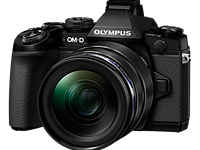 XT1 may edge for APSC sensor overall image quality and low noise in low light, however the lens range available on Olympus EM1 is extensive and can produce great images and great colour images out of camera. GH4, if looking at video would be the number one, but image quality I would put Fuji and Olympus ahead in their great out of camera jpegs, useful to the general consumer or enthusiast not always wanting to process Raw for personal photos. Sony should have been in this list, and although Nikon has great cameras in its DSLRs as does Canon, they really need to develop a mirrorless with a larger sensor as the 1 sensor cannot match the quality of any of the others. Sony has some impressive cameras out this year, one should have been on this list. My thoughts anyway. Yours may vary. GH4 is a better stills camera then the EM1. It's faster, has better features and a better menu. Add in ergonomics and they made the right call. The only thing Oly has going for it that is better is the IBIS and that is only important for a very narrow type of photography. It sure isn't important to me, though it would be nice to have. I'd easily give up some of the video specs on the GH4 to trade for the 5 axis, but I'd never trade my GH4 for the EM1. The Fuji XT1 or Samsung NX1 will produce better stills than the GH4/EM1 m43 sensor. ChuckTa - unless you could only get the photo with the GH4 due to better AF, quicker ergonomics, or some other feature. ChuckTa: in fact this is clearly demonstrated (at least in the test scene). And, Dr_Jon, all indications are that AF on the NX1 is very good. Go to the NX1 section and click link to studio test scene. The comparison defaults to the cameras mentioned. Em1 all the way i had the XT1 and I preferred the Olympus in every thing. The Nikon 1 was included but the Sony A6000 was not? That is wrong. The Nikon 1 is a compact camera; a vastly overpriced compact camera which produces compact camera IQ. The A6000 produces images on a par with anything short of full-frame and handles well. Its ommision is a huge oversight. Small, fast, light-weight and fantastic IQ is the very definition of the enthusiast mirrorless camera category. NX1? Nikon 1? I don't think so. I very nearly bought the GH4 but it was too much money for a DSLR with a shrunken sensor. Unless one is invested heavily in lenses or has decided to get good at video, it makes a lot more sense to buy a D5300 or K3 and decent lens instead. DPR is definitely getting confused. As to the category system, I agree it is messed up. It should be "What can I get for X dollars?" or "How much must I spend to do this?" Not "Does it have a mirror?" Oh.....Mr. know everything...you've had every camera and know how everything works. Don't pretend like you run this .com..........u don't. What a strange man you are. If you object to opinions different from your own, here's a tip. Don't read the comments sections. Ciao! I believe the Samsung NX1 IQ has surpass the Sony A6000. Base on DPR, the NX1 has the best APSC IQ right now, you can check in the DPR image compare, look at iso 3200 raw (note NX1 use a zoom vs A6000 Zeiss prime). The Video is also better than GH4, do a search on youtube. I think "enthusiast" is define more by function rather size or even IQ. But I also feel that the XT1 and NX1 are in markedly different categories. Maybe it's because the A6000 comes closer to the high-end roundup than the enthusiast level? I mean, its burst speed surpasses the 7DmkII, it's got the best phase-detection autofocus (reviewed) in the mirrorless market currently, and it has an APS-C size sensor to boot. In terms of pure performance, it even beats out its A7 cousins. The NX1 may beat its performance specs, but it's also just freshly released and costs four times as much for a bit more bulk and weight. But the body is distinctly "affordable." I have no qualms about it, but as you say, its performance far outweighs its market-segment and perceived [or even actual] quality. Pit it against an XT1 and there is absolutely no doubt that the Fuji is far more satisfying to hold. Perhaps Sony is being too clever? When Audi first started, they were considered "too cheap to be good", despite the fact that their cars were just as well-made as their competition, Mercedes and BMW. So you know what they did? Simply increase the price by 35% and viola! People started taking them seriously. The A6000 is a giant-killer, but it looks like just another NEX. Mind you, the word is getting out. Well, the A6000 is the top choice for the mid-range mirrorless roundup, which makes sense, but a little unfair since its performance far outclasses the ones shortlisted, and for a typically lower price too. It kind of makes more sense to put it in a higher bracket comparison, but perhaps its price point is the problem here, like you mention. Its price is about the same as the older NEX-7, which the A6000 has already surpassed in terms of performance and image quality. Comparing it with a Fuji however, is kind of difficult. The Fuji is much more expensive, but you are getting super image quality. But ergonomics play a part too. My experience playing with a Fuji (I've tried the X20, X30 and X100 and T) however, is that the interface has always felt a little bit clunkys. It does everything you need it to do, but it just doesn't feel as smooth, which is a bit of a shame, because the hardware is plain amazing. The other consideration is price: there's no doubt Fuji is expensive. The A6000 uses 15 cross-type AF points vs NX1 153 cross-type points ( 7Dmk2 has 65 points). A6000 burst is 11 fps vs NX1 15 fps. The higher cost of NX1 is due to its enthusiast nature and is actually price lower than GH4. I would agree the A6000 is good value however, but for me, I will wait for the Samsung NX400 with the same 28mp BSI sensor, which I think is best in class. Also, I think Sony's price point is lower because their E-mount lenses have been hit or miss. While Sony has been pushing a lot of cutting edge tech out, they're neither here nor there in both the DSLR and mirrorless markets. I like that their designs don't stick to a convention, but at the same time, it scares traditionalists off from buying a camera that looks like a DSLR, but isn't conventionally one, like the A77mkII. They push a lot of new ideas out, but the products hadn't felt mature up until the A6000 and A7. With the way both cameras are shaking up the mirrorless world however, I don't think Sony cameras are going to remain the cheaper brand for much longer. I'm not arguing that the A6000 is better than the NX1 in terms of performance. The NX1 is far more powerful, and goes toe to toe with the 7DmkII. But it's also a lot bulkier and heavier as well for a mirrorless, especially with the 16-50 f2.8 kit lens option, so it's more appropriate to treat the NX1 as a near DSLR that loses a bit of the size advantage of a mirrorless. I'm just saying in light of these comparisons, the A6000 isn't too far behind. Cross-type focus points are only important for moving subjects, and while having more is great, it's more important to have them at the right places. Not to mention the fact that if you primarily centre focus and recompose, you only need one (really) good focusing point. Essentially, as far as price/performance ratio is concerned, the A6000 is as good a balance as I can think of. I don't think many people saw the NX1 coming. It could really shake things up. But those who frequently photograph moving objects tend not to buy a mirrorless camera. I don't see it as particularly relevant to this sector, just as for some cameras, weight is inevitable and often pleasing. If I buy something like a 5D, I want it to be solidly-made. If I buy something small enough to take with me everywhere in a shoulderbag my priorities are different. 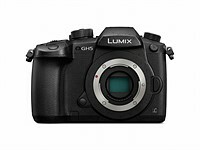 Micro four thirds gear is very expensive. It would be great if Samsung concentrated on improving the full-sized sector while Sony revolutionises the smaller bodies. NX1, A7, A6000 and XT1; these would all have seemed like Sci-Fi when the D300 was launched just a few years ago. BTW, I didn't buy a Fuji precisely because of those great colours. They are so distinctive that I feel they can overshadow the actual image. Well, it's always nice for new bars to be set, and though I'm not a fan of Samsung, I encourage anything that prevents manufacturers from getting too comfy in their success, which unfortunately is what I feel is the case with Canon now. Sony pulled off something of an industry miracle with the A7 and RX1, but it's not going to take long for other brands to catch up. Next year will be quite interesting for full frame. Weeelll, Canon are throwing everything they've got at their latest "Flagship" and are still behind u4/3 in IQ, Nikon are notorious for being unconcerned about their cameras actually working, have crap colours and a terrible AF spread, neither Pentax, nor Fuji, Nor Panasonic, nor Olympus have a full-frame model. Sony SHOULD be the new Kings of FF, but if they don't get some killer lenses in the next 18 months they will be "the company that didn't understand photographers". The silliest thing is, Panasonic should be the new FF kings. Given what they have done with their sensors, a FF GH5 would be astounding. Will they though? Doubt it. I think Canon is really lagging behind in their full frame models. The 5DmkIII is simply too expensive for everyone, and it's getting a bit long in the tooth. The 6D is great for what it specializes in, but the Nikon D600 beats it in most respects, and again, even at its best, it's only a good camera, not a great one., not to mention for a 2-year old system, it's still more expensive than the new D610. Canon's full frames aren't bad, but they're not offering anything Sony and Nikon don't. Newer Nikon and Sony full frames have lower noise, higher megapixels, better dynamic range, quiet shutter mode (which ironically Canon implemented first in a FF) faster burst speed, offers crop mode to use with APS-C lenses and still gives you a fairly big image, and come in a cheaper package too. Kinda sad that the only reason to get a Canon full frame in light of all of these reasons is because I already have the glass for it. I've said it before and I'll say it again. The situation with Canon is very sad. The 70D is a lovely camera to hold and use; I nearly bought it. But the images it produces are simply not up to today's standard. I am very happy with the output of my A6000; so much so that even The Mighty A7 is not automatically a better choice- +1 bit of colour depth, +1 E.V. of DR but the trade-off is slower AF which is uncertain in low light and losing the sweet spot you gain using FF lenses on a cropped body. The A7II appeals, but the upgrade in IQ is smaller than the upgrade from a 70d to an A6000! Well, I don't think Canon's IQ is unacceptable, just that having seen what my A6000 and an A7S can do, Canons just don't impress me. They get the job done, but other brands get the job done better for cheaper. Which just doesn't make a lot of sense to me. I might wind up getting an A7 however, even in light of its slower focusing speed compared to the A6000. Now that the buzz is centered towards the A7mkII, I have the opportunity to get an A7 at a very good price, far cheaper than even my most optimistic estimates. So I might go full frame before the year is through. For the most part, I disagree with a mirror-less digital camera. Why the complication, and sophisticated electronics to observe through the lens of any camera, and its design, to view the scene or subject, essentially the physical world in this way? It does not make complete sense to me that a mirror-less design is essential, and important in photographic design to take better, or more correct pictures. Why not concentrate on more accurate and reliable internal meters, inside a camera, especially a serious moderate to expensive one, for serious, exact photography? I agree with some of the posts below that these categories don't really make much sense to me from a use-based perspective. The rather artificially designated "high-end" dependent on having a full-frame doesn't make sense, as this one attribute appears to be a one-dimensional, where bigger is better. If that were the case, then medium format digitals would be even more "high-end". Seems to make more sense to classify on their overall capabilities rather than enthusiast, high-end, Both the X-T1 & E-M1 have made significant inroads into pro ranks as very capable workhorses that meet professional needs for shooting in a wide variety of scenarios, as well as having a lens lineup available that also meets a full range of professional needs. Seems to me that a camera *system* like OM-D or Fuji X is a much more qualified professional sytem than Sony A7 series, which is hampered by a lack of professional lens selections. As such, one could view these as more "high-end" than the Sony. I found your comparative table of camera specs convenient but notice that for the important item of viewfinder magnification some of the values correspond to 35 mm equivalents, and some to apsc or m4/3. Needless to say that requires further calculation by the reader for an evaluation. In both the review and here you list body plus batteries at 550 g, yet all other reviews list this as the body only, and give the combined weight at 640g. No mention about 4K video for Samsung NX? Interesting to see some DPREVIEW readers getting so very excited about which cameras have been incorrectly categorised or excluded, or are best etc. If they already know so much about the cameras why are they even reading a comparison article of cameras they already know about?!! Hmm! To see if the editors got it right, of course. I think people are exited because the choices made in these round-ups give the impression that marketing is driving the way decisions are made at dpr. Isn't DPR, by separating mirrorless cameras into their own groups, saying that even on the verge of 2015 mirrorless cameras still cannot compete with DSLR's? Or the other way around. True, that is why I'd like them to be compared I don't understand why they would be separated into different categories as they both serve the same purpose. o ok i get it now. - Its like acoustic guitars some have nylon strings others have steel strings why separate them its not like its electric guitars & acoustic guitars together. Thank you. You don't compare compact cars vs sports cars vs SUVs vs pickup trucks, although you can drive each of them the same way to get somewhere. They are different class, because they serve different purposes. To me cameras are the same, I feel its pointless to compare each other. > They are different class, because they serve different purposes. So what purpose does an internal mirror serve? > So what purpose does an internal mirror serve? It mirrors what camera sees to viewfinder, so you can see what camera will capture. I'm not saying which is better or worse than the other. Same need, different approaches, with their own pros and cons. Enough physical and technical difference to classify them into different category (hence the 'mirror'less...). > It mirrors what camera sees to viewfinder, so you can see what camera will capture. I beg to differ. The mirror reflects what you see, not what the sensor sees. EVF reflects what the sensor sees (with limitations, of course). Ultimately, both are just framing devices. Back to the original poster's point, why should we separate DSLR from mirrorless into two separate categories? Today, EVFs are slow and have limited gamut. But I can imagine the technology will catch up real fast. These comparisons should be done based on target market rather than camera technology. See you're (dpr) still very much focused on product and very little on customer segment. Focus on customer needs and you'll be better off. That makes more common sense than the way they have it set up now. I totally agree with you, lacikuss. A target market is more accurate, and simply more valuable, and practical for the "customer segment". As for the design and engineering of mirror-less cameras, please read above my opinion on this method of photography.Personally, I think that a camera of moderate or very expensive cost, and precision should have better, more correct meters! Well, you have eight categories... each category would need several cameras to make it worthwhile, right? How many cameras have been released this year? Or, in the interest of working with the articles that already exist (so that this is feasible before Christmas), DPR could just apply some additional 'award badges' to each current segment for best (a) video, (b) landscape, (c) family/people, (d) sports/action, (e) portable camera, etc. in category. Yet, DPreview insists that the RX100 isn't a competitor to the Ricoh GR. How would you define best night shooting camera? Would you use the kit lens or would you use a prime? Which prime? Which focal length? Fuji's kit lens starts at f2.8, would that mean that the camera is better night shooter than one that comes with an f3.5 kit lens? Size and price are more important differentiators than mirrorless or not, the GH4 and the NX1 should be placed against cameras of their size and the price, image quality and features then compared against others in the same size category. NX1: not so sure. There have bene mixed reviews already and its lowerlight performance both for noise and for C-AF is not as good. Some have "shown" in lower light it can't track as well. As a comparison: my GH4 has no problem with lower light. This seems to be a downside of many OnSensor PDAF systems. But it is early days, so I'll await good reviews that put effort in the autofocussing part. I feel especially this Samsung (and the Nikon 1 V3) deserve this as they on paper at least stand out. I think it will be in another roundup with EM10, GX7 etc!? Sony A-7* are higher market and A6000 slighly lower comparative to XT1, GH4 on some grounds!! A6000 was already covered in another Roundup. If I have to pick one from OMD-EM1 or GH4, it won't be an easy decision. If its about 4k recording, then its very easy pick .. GH4 is the only practical solution out of all available cameras. On the basis of still photography GH4 is again an amazing camera offering almost anything you would want, other than missing IBIS feature. EM1 is equally good. So it's more about personal preferences handling etc or brand loyalty. Overall, I would say yes, GH4 is slighly better camera out of this bunch to recommend! Well, I have GH4, but I agree that we'll have to wait and see how the NX1 performs. If excecuted well it might be the better camera of this bunch. I personally prefer the em1 but to be fair, it is getting matched or superceded by very competitive products in the same category. Luckily, the EM5 successor is just around the corner. We know it will already have PDAF and possibly 4K too and could be seen as a partial EM1 refresh but at a lower price point. Of course if you have E-M5 or even GH3 don't really need to switch to GH4. But this guide I believe is for new adapters. In any case m43 is getting very exciting with these new enthusiast level cameras from Oly and Pany. If the primary objective of this article, was to advertise (indirectly) Sony products, then the objective has been achieved. P.S The main restriction when buying a product is the price, in this case the product(The GH4) is an overpriced average photo camera, the whole "2014 Enthusiast Mirrorless Camera Roundup" is at least .... unfortunate !! That's weird since Sony(rightfully) won 2 categories. However there has been well based criticism about the way you guys putted camera's in the same category. And not putting the a7 series in any category while it is a very interesting proposition is weird as well. Now it's a different camera then the others. But it sure is a good enthusiast one. In some ways a lot better then every single one mentioned here. ...but I don't shoot video, I revel in customization, IBIS is essential offering both Oly and Pany lenses (I have both!) and the smaller the better! WINNER: OM-D EM-1!!!! Hello??? I don't shoot video either, but would never trade my GH4 for the EM1. Some obvious omissions here notably Sony!!! Also mirror-less implies small light weight camera so how come there are two bricks as winners...oh because they've got 4K. Why is this site so wrapped up in 4k did the editor by a new TV!!!! 4k is a marvellous feature like wifi, and gps but these aren't what make a camera good! DP this has got to be the worse review EVER. I believe they've gotten to the point where they like to press buttons then sit back and chuckle at the consternation it causes. Quite sadistic actually. I guess they wanted to stack the deck by excluding the A6000, it would have destroyed these cameras, esp. when price is factored in. Yes, because what we REALLY need is overpriced 'f1.2' lenses to resolve antiquated tiny sensors. Why would you want a fast, light and inexpensive system that out resolves them all when you can pay for overpriced overhyped gear instead? This bode well for those readers gear of the year award thingies. The meltdowns will be even sweeter. If there's one enthusiast camera out there i'd say it's the Sony A6000... Ignoring spec / class / category "rules" that is. The main thing this article proves is how expensive these cameras are compared to APS-C Canikon DSLR's and Sony Alpha ILC's. I really want an X-T1 , I fell in love with Fuji with their XQ1 and X-S1, but its not twice as good as a A6000. And M43 camera prices are baffling. M43 at least has big body variation for all pockets, obviously you choose what fits you best. Not everyone needs extra features like robust and weather sealed build. Size as well, smaller not always cheaper. A6000 indeed would be interesting choice if there was good enough lens choice, but I personally don't like what they offer. 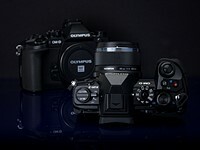 You mean like the 300 € for the Olympus E-PM2 with kit zoom or 440 € for the double zoom kit? As it stands there are cameras here that don't really belong here (V3) and cameras in the other one that probably should belong here (E-M10 and A6000 / A7 series). Then simply make price a consideration for 'what's best'. But the weirdest part is putting the A7's in with mid range FF DSLRs, which makes about as much sense as including the Leica M 240 and Monochrome (and M-E) into that class of camera. It's a mirrorless camera, put it in one of the mirrorless classes. You've admitted yourselves that mirrorless should have its own class then omit some models because...? It's like this, this way DPR can disparage the A7 series for not having enough lenses and focus tracking compared to the D750 etc while completely ignoring their direct competitors enabling them to be put on a pedestal. And then they can put the A6000 down with the middling class in the same league with the A5100 and E-PL7. Good point. Dpreview had the whole A7s vs GH4 combined review and then don't put them in the same category. A6000 is probably to cheap to be included but as a still camera its on par with all the others (unless the NX1 delivers). the a6000 is included in the "mid range" group, which sounds right. The A7 ... probably they just couldn't decide to include it in the same category... and it can be a category of it's own... maybe others will join in this category. badi, DPR says as much in the comments section and the article itself (which hardly anyone bothered to read lol). There's some kind of low end FF roundup coming with the Nikon D610, Canon 6D, Sony a99, and the Sony a7-series and it's pretty obvious which one will win already. Some here just thinks it's the special Olympics of cameras and every brand, especially their own favorite, should be represented. Quite a range of performance in this group from little sensor high noise to reasonable. but you forgot to mention the excellent Panasonic's GH4 'depth-from-defocus' (DFD) AF-technology. That gives it an outstanding continuous-focus performance for stills, with 7.5fps in AFC and a buffer capacity of 35 shots Raw(+JPG). Not to mention the lightning fast AFS. This is a big plus(a like) in my opinion. So the GH4 is, apart from its well known and stressed video capabilities, also a very good action/sports shooter. DFD only works with panasonic m43 lenses. I think it lost to the 153 cross-type AF points covering the whole sensor and process by the quad-core image processor. The GH4 didn' do a very good job here, with some back focus problem. I use the GH4 with my Olympus lenses (45mm f/1.8, 75mm f/1.8, 12-40 f/2.8) with no problems at all, even with continous focus. Video AF was not mentioned in my comment, that is an area that I haven't tested thoroughly so far. I'm a stills shooter. I've been an enthusiastic photographer for more years than I care to remember & admit to having the camera but consider the omission of the A6000 from this comparison a bit bizarre, especially if the Nikon is included. DPR gave it a very good review, as have most other reviewers, so I'm baffled, is it too cheap for you ? Clearly what this shows is priced based categorisation is stupid. In any case that ISN'T the categorisation used. They talk of enthusiast level mirrorless cameras. The fact the A6000 is definitely that level of camera should see it here. The fact it is considerably cheaper than some of the others should give it additional browny points not exclude it! Typo: " the NX1 could usurp the DH4 as our recommendation in this product class" Pretty sure you meant GH4. This is just bizare no Sony cameras when between they effectively dominate mirrorless? The A6000or the A7 should definately been here if your were seperating by price the A7, if by features the A6000. If your going to claim the A7 is a different category I might understand though as I've mentioned the price is similar to half these cameras but the A6000, sure it's cheaper but feature wise? Claiming that's a different category when your putting the Nikon 1 V3 here is just foolish. In what world does Sony dominate mirrorless? Sony does interesting things with camera's (but never finish it) but they don't dominate. The only thing Sony dominates is the 8th generation homeconsole market. I think they will create a separate category for the A7 line since the A7 cameras are so much superior above these toys. 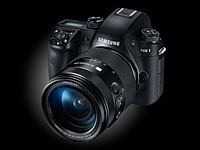 Great sensors in the A7 family, but a camera is not made by it's sensor alone. Besides the sensor there is nothing special about it, just mediocre. This confusion is caused by the irrational need to consider "mirrorless" as a separate category of camera, while some mirrorless cameras are just as large and just as expensive as cameras with mirrors. Image quality can vary greatly in both types, because the presence of a mirror has nothing to do with the quality of the result. The sensor size has more to do with that, so categorizing cameras by sensor size would make more sense than by whether they have a mirror or not. The real distinction should be small cameras vs large cameras, or cheap cameras vs expensive cameras. Making this a separate category makes about as much sense as rating cars with navigation systems against cars without navigation systems. The MILC fans (and I am one of them) cannot have it both ways. We say this format is superior because it is smaller and lighter, then we select cameras that are "almost as big, more expensive, with image quality almost as good," as reasons for going with the format. To answer the question "In what world does Sony dominate mirrorless? " "Read our updated enthusiast compact camera roundup." Copy-paste error? A7 family should be here but DPR sees it as a different class, see comments. A5100 has no EVF so is much lower class. LX100 isn't a MILC. Ahh you are right about the LX100 ;-) Sorry. What camera should I buy if I am to view images on a 72-in 4K flat panel, whilst enjoying enough surplus pixels to do some reasonable zooming? My burning desire is to reproduce the experience of a slide show (Kodachrome 64, Nikon F, FTn, F3, N2000, Nikkor lenses, Leica IIIg, Summitar 1.5, Leitz and Zeiss projectors). I just can't have any more 13x19-in prints in my life. 4K is 8.3 megapixels, so in that regard basically any new camera has that and more. Very funny to see that the differentiator for Enthousiast vs. High End mirrorless is NOT based upon the feature set, but only based upon the fact that a camera has an FF or APS-C sized sensor. Makes this whole Roundup useless. Yes and no. Take away the full frame sensor in the A7 and what have you got left? A pretty average camera. Slow, questionable jpeg engine, cooked RAWs, not built particularly well, not too ergonomic. A camera like the NX1 is a monster in comparison. Samsung threw everything into their flagship camera. bluevellet: Do you own a Sony A7? Or have you just read this on the internet? Because what you are writing is nonsense :-) Please bring some seriousness and insight instead of postulates. Thank you. By all means, offer your insght. I await with bated breath. But in the end, I'm guessing your insight is just a difference of opinion but you're too lazy to even make the case. Here's a clue. Everyone has opinions. You, Enenzo, returned your A6000 in disgust because you thought the EVF was horrible compared to the NEX6. You can insist you really thought it was awful and even point out the downgrade in spec sheets. Yet for a large chunk of Sony fans, including the DPR staff, the A6000 is awesome and the EVF is good enough. Are you wrong or are they wrong? I'd say neither. But for a site dedicated to photography and gearheads, sharing opinions on the subject should be exactly what forums and comment sections are for. Not including one of Sony's A7 bodies in this roundup makes me wonder about these tests. But yes, those roundups are a joke. Time to leave DPreview, I get reviews much faster elsewhere and not as biased as here. They are without doubt, the biggest mirrorlesses. I'd agree, but they can also be classed as professional cameras, if they're used by professionals, as some are, in which case, they'd be among the smallest professional cameras. Sorry - I'm having a grammar moment. "If its manual control points you desire..." should be "If it's manual control points you desire...." Now back to solving world problems. What?? No Sony A6000 in this group?? No A7ii/s/r? The Nikon 1 is totally out of its depth in this group . . . it's not even a fair comparison. But it does show what Nikon thinks of the whole mirrorless thing. . . The A7's are not in the same class either. That's what the rumored A9 will be for and will probably be part of a similar roundup article next year. Canon and Nikon still paying lip-service to the concept of mirror-less. Lol the V3 scored the worst among enthusiast mirrorless cameras. It is also the worst in terms of IQ among all 1" sensor cameras including compact and mirroless. The Jpeg engine is rubbish, sure, but shoot RAW with a good prime and it's defnitely better than the RX100 III (the zoom lens that you can not change holds it back). The NX Mini is also quite good with a prime. Check Thomas Stirr at Photography Life. His photographs taken with the V2 and good lenses are exceptional. Also check Joe Márquez at Flickr - stunning photgraphs with the V3 and the 32mm f/1.2. Oooh! Canon has just collapsed and smashed the M into pieces! What a tragedy! The EOS M has disintegrated into oblivion!" The Pentax K-01 and Pentax Q never got out of the gate! Except of course Nikon mirrorless and Canon mirrorless sell more than anyone except Sony mirrorless. So much for that analogy. Fuji xt-1 is a fine and very good camera. But Sony A6000 give you about the same at half the price. So this one is my best enthusiasts mirror less camera. Same weather sealing? Same humongous EVF? Same ergonomics? Same controls? I think you are confused about what makes a camera like the XT1 a different class from the A6000. same quality print till 13x19".. I think you are confused about what a camera is useful for. Well, have fun shooting in auto mode on a budget. Those who pay more will likely get more shots they want because they bought a more rugged, manual and precise instrument for the job. If u like, you can use auto mode with Fuji too.. but personally I never used. On this forum I've learned never to disagree with a Sony fanboy, even if they are wrong. @bluevellet - Cool, please point me to an Olympus, Panasonic or Fuji system camera that scores in the mid teens better than the A6000? You claim it's about the 'system' and Sony's is rubbish, so show me a pairing that performs better? Lucinio, you have yet to learn the law of nature that the more money you spend, the better the end result. what? Aren't you mixing several different discussions? And you want to talk about scores with DXOmarks? Here? Crop-sensored camera+lens combos don't score better than 30 with primes and not better than low twenties with zooms. And that proves my point, thank you. That FE zooms underperform on a gigantic 24MP, APSC sensor and are either matched or exceeded by m43 zooms on a miniscule m43 sensor at 16 MP? Take what you want from it, I see that an under performing FE 'kit' zoom with A6000 performs to the same level as a $1000 'pro' zoom on a twice as expensive body. You can shuffle the data all you want, but as a 'system' you are getting the same performance for less than half the price. Then turn around and look at the primes and comparisons just become laughable. EM10 is not twice as expensive. Pay attention. M43 tends to use the same sensors across the whole line with only features, size and build differing between models. What's funniest about DXOmarks is the 24-70 f4, the lens supposedly better than the FE kit zoom, costing 1000+ dollars, actually scores worse than the kit zoom. And both FE lenses score worse than the either pro standard zooms on m43. That tells me it's not the APSC sensor that is bad, it's the lens themselves holding it back. This is not a shocking revelation, the stereotype of the whole NEX system is good sensor/so-so lenses since day one. The E-M10 costs a little bit more than the A6000. Sony cameras are the best in papers; but there is a different comparing them in papers/DxO and real life usage. Cameras aren't graphics card or mobile phones to measure based on performance. There are much more factors to them. Otherwise I may as well say the A6000 is better camera than the D3 or D4 series from Nikon or the 1D from Canon. And yes bluevellet is right. The m4/3 line pretty much offers similar IQ across all Olympus/Panasonic bodies as unlike Canonikon they don't cripple their sensors deliberate on lower-end models. People buy the body they want based on factors like weathersealing, ergonomics, size, etc even if at the end of the day the E-PL7 performs almost (99%) as good as an E-M1 in terms of raw IQ. And yes the E-Mount isn't seen serious by Sony, thus why they keep delaying/cancelled any pro-oriented lenses for it. As for using FE lenses, why would you get an APC-S camera and use a bulkier FF lens -other than the extra reach for sports/birds? Especially at wide/normal range. My point is: It performs great as a body in terms of IQ/FPS as Sony is a great engineer, but you can’t base what is its category alone on hardware/paper specs. Atholine. it makes sense if you're heavily committed to Sony, owning FF bodies already (or planning to) so using the same FE lenses on APSC is for convenience. I can understand that. But buying those overpriced lenses for exclusive APSC use is a waste of cash. It's unfortunate DXOmark never tested some of the higher APSC zoom lenses for NEX. The 18-105 f4 is probably too average in performance, but I am willing to bet the 16-70 F4 would score at least just as well as the FE standard zooms (on APSC). and even probably better. It has a more useful zoom range too. I believe the 16-70mm is quite good. I am disappointed with the FE zooms -thus why I didn't got an FE camera yet. Thought the 16-35mm supposed to be reaaally good. Which camera should I buy? Sony, but I didn't know that Sony is not the enthusiast mirrorless camera. And the a7-series will be covered in a separate roundup, before Christmas. Its strange that DPReview just differenatiates only on sensor size, not by usability, feel and user set. Makes this roundup useless or the writer of this article clueless. "Makes this roundup useless or the writer of this article clueless." A little extreme, I think. There's no easy way of drawing class/market divisions. So I just wonder what cameras will classes with a7 in your round-up? Only a7s and a7ii, since.no other milc are in same category by dpr standard. Or with leica T, 645Z, hassleblad stellar ii for i-dont-know-where-to-place-them category? X-T1 and the Oly EM-D, and the Panasonic DMC-GH4, or Samsung NX1 have as much or more to offer except for Full Frame then some of the Sony's. Whats left in your 'high end' mirrorless class are just Sony camera's. Either you are paid by Sony to put their camera's in a 'class of their own' or you are misinformed. Even though the Sony's have a nice picture quality. Their handling, AF speed, and even featureset is in some cases less then some other mirrorless brands offer. Its the total quality, build, feel, handling, support and feature set that makes or brakes a camera. Next to the fact that those items should be the differentiators. It should not only be based upon the size of the sensor. "A little extreme, I think. There's no easy way of drawing class/market divisions." Ever heard of the thing called price? It often happens to be one of the most important attributes in when buying a camera and allows your to compare cameras with out using such artifical categories as you have here. If you went on features your'd have the A6000 here from Sony and all the other would look a little expensive, and the Nikon probably wouldn't have fitted. Barney is right. It really isn't easy to decide on classes when all types of cameras can work pretty well, or work pretty poorly. Grouping them by "whether they have a mirror" makes less and less sense today. "Its the total quality, build, feel, handling, support and feature set that makes or brakes a camera." This is the sort of mystical set of undefinable je ne sais quoi that Leica enthusiasts use to justify their high priced choices. Sorry but I have to say Sony A6000 is the best mirrorless camera for both midrange and enthusiast . Paired with what ? I like the A6000 but the sistem is seriously lacking any ,,enthusiast,, lenses. And the camera have no balance with larger lenses anyway. d3x, play with it at Least a week, the OSS uses fixed 50 or 35 fixed. You change your mind, price and quality is the best. You used somehow 70-200 him and saw that it is not balanced? or: use of A6000 or speak from hearsay? Put verdicts only if you use these devices. d3xmeister, A6000 paired with "enthusiast" Zeiss 55mm, Zeiss 35mm, Zeiss 24-70, Zeiss 16-35, 70-200 OSS !! You're wasting the APS-C sensor of the A6000 when restricted to FE zooms. The lenses were definitely not optimized for APSC sensors and score only in the mid teens on DXOmarks (when used on APSC). I did have it for a few weeks. The A6000 is a great camera. But too many lenses are missing. And FF lenses are huge and completely unbalanced, not to mentioned the lack of APSC specific focal length. Can someone tell me what the difference between enthusiast and mid-range categories are. They seem redundant and in my view would be one in the same. IMHO the a6000 definitely should have been on this list too. d3x,a 18-200, 35/1.8 and 50/1.8 are sufficient for me . Can cover the entire focal range they use. If you want more, you have all Canon lenses + adapter to benefit from all the functions (AF, stabilization). If you want more, you have all lentillele vintage. Some are wonderful, with personalized results. So: I think the problem lens is just an excuse . IQ device is great for APSC, focus peaking is wonderful, the camera is moving well, the price is unbeatable.The fact you don't like Sony does not make it a bad deal. He knows as much as EM1 or XT1 at half price ( in some cases even knows more / ex . landscape -EM1 ) . I like Sony. I like the A6000. I do own other Sony cameras, but not NEX. You can defend it all you want, it lacks too many serious lenses that I need. Adapted lenses are not a solution for me, turning a nimble wonder into a sluggish unbalanced nightmare. Introduced just three years ago, the Samsung NX1 was both a technological tour-de-force and a great camera to use, earning one of the highest scores we've ever awarded and winning our 2015 Innovation Award. But its short-lived run in the photo world leaves us wondering what could have been.